When it’s time for a custom maple kit, look no further than Ludwig, the original American custom drum company. 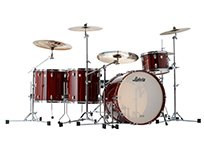 Ludwig Classic Maple drums are made in the U.S.A. and have loads of configuration options and colors to choose from. 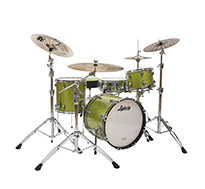 Shells are made from North American maple using 7-ply construction with cross laminated ply layers and grain rotated 90 degrees between layers for rock solid strength and booming performance. Bearing edges are cut to a 45 degree angle for that unmistakable Ludwig sound. 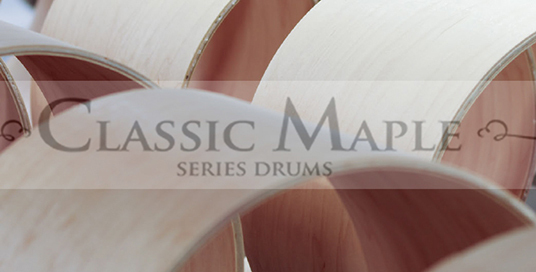 Choose from Classic Maple kits or configure your own kit with Classic Maple Components. Kits include eight outfit packages in four, five and six piece configurations offering a wide variety of options for easy ordering. Classic Maple drums come standard with Mini-Classic lugs, Elite tom brackets and Elite spurs. Or select Ludwig Classic lugs and brackets, Rocker or heavy duty curved spurs. Ludwig Vibra-Band tom mounting system is also an available option. For those nostalgic for the 80’s, modular tom holders and mounts and long lugs are still available. You'll also notice the cast Keystone "Monroe" badge, along with the new Die-Cast bass drum claws, and Atlas Mounts! There are many colors to choose from, exotic veneers, glass glitters, gloss lacquers, electrostatic and vintage wraps. Here are a few Ludwig Classic Maple kits, please contact us for prices and information on all kits. 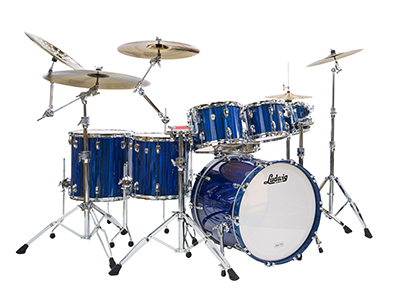 Classic Maple drums come in a variety of colors including popular sparkles.